Holly’s internationally published relationship enhancing book about Reigniting the Passion was featured on NBC’s The Today Show on the 8th of September, 2006. Move over Regis and Kelly, Fox News new morning show is a smash. 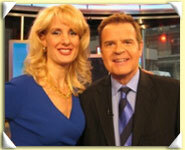 Holly was a guest interviewed on the pilot of Fox’s The Morning Show with Mike Jerrick and Juliet Huddy. The pilot was filmed in New York City on November 1, 2006 before a live studio audience, the show premiered across the Fox network on January 22, 2007. To request clippings or copies of any of the above, please email info@AttitudeAuthority.com. Additional photos are provided in the Photo Gallery.